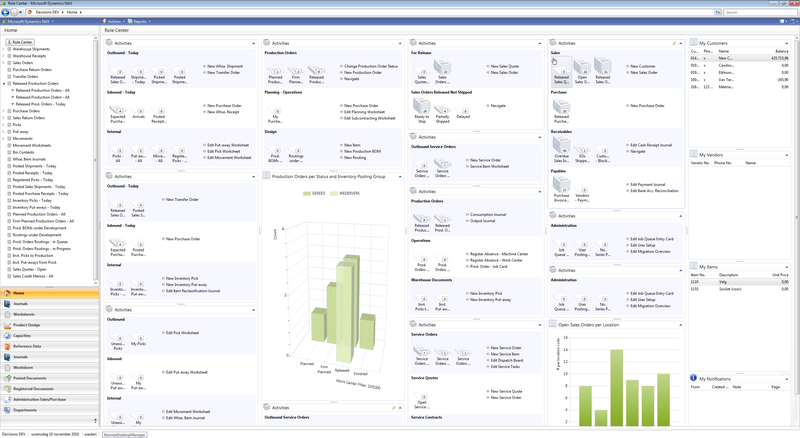 Waldo's Blog - Microsoft Dynamics NAV Biggest Role Center ever! WARNING: the contents of this blog is intended to be a joke! No Role Centers like this should be created .. at least that's my opinion. So why do you write this junk then, waldo? It has a huge screen with a huge resolution (2560 x 1440) which is as sharp as hell. And be honest .. it looks good :-). Together with that, what I hear of consultants when they implement the Role Center, customers keep on asking: I need all roles.. . Can't you create a role center with everything in it? I always ask .. "do you really want that"? "Do you really think that works efficiently"?? They don't care, they just want it. If you might wonder: this is no photoshop, or whatever. It's indeed possible to use more then 2 columns on a rolecenter-page. I don't mean that you SHOULD do it, but it's possible. It's even possible to use a rolecenter-page as a part of your application (not being a rolecenter, but just a page that is calle by an action) .. . but probably you already knew all this.. .
Ps, anyone care to beat this :-)? Just an idea: when working on multiple screens, one could create even a bigger one :-). I think this really should discourage people who see it, it's got nothing to do with usability anymore. It's a good example too show you can do to much and should keep things simple. Maybe your post need an additional disclaimer: DON'T DO THIS AT HOME! Well, I deliberately didn't make this available as a download .. it's just an "idea" what it would look like .. . And it looks like crap if you ask me. On the other hand, if someone DOES want this .. then it's the partner's job to either create it, or discourage it.. . This is great! But as David says, then with no doubt we will soon hear: "Where can we get this?" Well .. then it's up to the partner to convince them otherwise.. . it's like I stated in the beginning of my post .. it's a joke and I don't recommend it. We all want the biggest. The thing is that someone will see this (some manager in a division perhaps) and say to their partner "This is what I want".